Pacifist, celibate, and highly religious, the Shakers are perhaps best remembered for their furniture. But they also possessed a fascination with the mysticism surrounding teenage girls who spoke tongues. Two of these teenage girls are the focus of Rachel Urquhart’s new novel The Visionist. 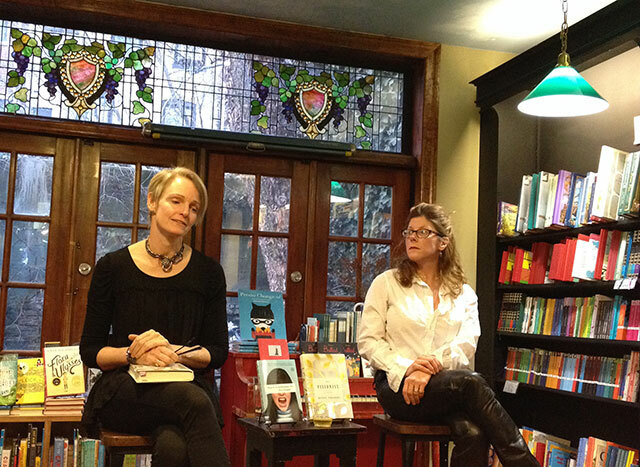 She was joined by Tin House co-founder Elissa Schappell at Community Bookstore to talk about the novel and the Shaker influence. Three different characters narrate the novel. Fifteen-year-old Polly Kimball, abused by her father, burns down the family farm. Sister Charity, covered in paisley shaped lesions, is believed to be possessed by the devil. Finally, Simon Pryor, an outside inspector, is sent to investigate fire. Urquhart reads a section from each of the characters. Schappell, who has been friends with Urquhart for some time, begins the discussion with an anecdote from their past. Urquhart had invited Schappell out into the country for a writing weekend. They spent their days writing and evenings drinking wine. One night, Urquhart suggested they read what they had written. Schappell describes the time hearing Urquhart read as a profound experience. Then a nursing magazine arrived at her house–a legacy of the former resident. On the back page was a picture known as The Paisley Lady, a photo from the nineteenth century of a girl covered in large lesions. She realized she would add this trait to a character too, the lesions the mark of the devil. Both Polly and Charity came from places of isolation. Their separation from society allowed them to become friends. The hardest voice was Simon Pryor, the investigator. “He’s the plot guy, the motor of for the book,” she says. Urquhart says plot challenged to her. “MFA stories didn’t need a plot,” she says of her time enrolled in a writing program. Because Pryor served an important role in building plot, she says that she “dreaded writing his sections.” Pryor’s first iteration was as a series of letters written from a judge. The novel required three years of research, though this was spread across a decade of writing. Urquhart sent a draft to an academic Shaker expert to consult on the accuracy of the novel. Apparently, accurate Shaker history is big business. Though mostly correct, the novel required a few alterations. For instance, Urquhart wrote a scene with young girls wearing bonnets. While Shaker women wear bonnets, girls do not. Only after achieving puberty are women provided the headwear. The bonnets covered the neck, a body part they considered scandalous. The bonnet also acted like blinders to prevent women from shooting flirtatious looks at men. At one point, Urquhart had to rewrite the entire novel from scratch. She was just a few days away from sending a copy of the final draft to her editor when her laptop–with the only copy of the manuscript–was stolen out of her home. The backdoor of the house had been left open while she was sorting recycling. The laptop went missing, though Urquhart only noticed the following morning. At first she thought she threw the computer out with the recycling and chased after the truck to try and retrieve the computer. Her neighbors later told her a homeless man had come to the door claiming he had found a discarded laptop in the neighborhood looking for a reward. The neighbors hadn’t lost a laptop, and so turned him away. The police eventually caught two men working in concert to steal expensive items and then return them for reward money. Urquhart’s manuscript was never recovered. She adds she wrote the book thinking that it wouldn’t be published.